As someone who often travels alone for business, self-defense is a topic that concerns me greatly. That's one of the reasons why I was interested when the team at TASER International invited me to review the TASER Pulse. The company describes this device as "an advanced, effective, less lethal defense tool" designed for "civilian self-protection use." 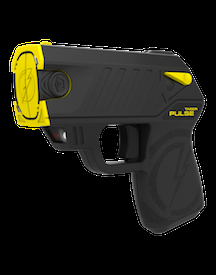 TASER Pulse is both a taser and a stun gun. It is important to note that this device is not a toy. It is intended for use in serious self-defense situations only. It costs just under $400 comes with a battery, two cartridges, a practice target, and a soft carrying case. It is well-made and well-designed. It is also fairly easy to use and carry. The device weighs less than eight ounces, but it packs a powerful punch. 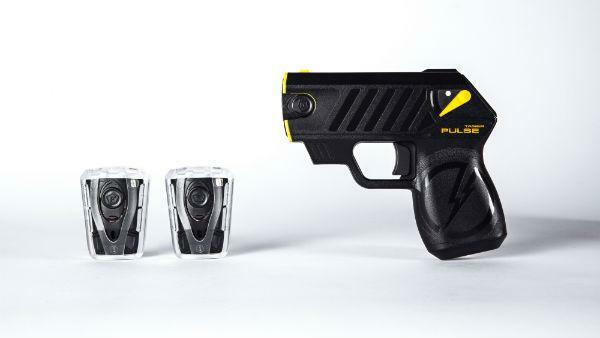 In order to use the device as a taser, it must be loaded with a cartridge. Each cartridge can be used only one time. It has a laser sight, and you can shoot an attacker up to 15-feet away when using the device as a taser. Aim matters, as the attacker will feel impact only if both probes from the taser cartridge come in contact with him or her. When the taser probes make contact with the attacker, it will immobilize the individual for 30 seconds. The contact will result in a temporary override of his or her central nervous system. Unless you choose to manually turn the unit off, this will last for 30 seconds. The device also functions as a contact stun gun when it is not loaded with a cartridge. In order to stun an attacker, you have to be close enough to physically touch him or her with the live end of the device when you pull the trigger. The current will flow for 30 seconds after you pull the trigger, unless you manually switch the device off. It has a bit of a kick when you discharge a cartridge, so practicing with it on a paper target is a good idea. Don't assume that you'll be able to safely or effectively use it to defend yourself if you don't practice and get comfortable using it. The money you spend on cartridges and paper targets for practice is well worth it. Replacement cartridges cost around $70 for two, though you can subscribe to the company's 'Lightning Club' and receive two cartridges and other items each month for $25 per month. The subscription option can provide you with a cost-effective way to practice using the taser to help you become skilled with it in case you ever find yourself in a situation where you need to rely on it for self-defense. Always, always, always make sure this device is set to 'off' when you are carrying it. It should only ever be turned on if you plan to use it. (The yellow lever on the product picture above is the on/off switch.) If you plan to keep this type of device in your purse, backpack or similar tote, you may want to consider investing in a holster. Because its shape is similar to a handgun, a concealed carry purse would also also a good option. One particularly good design feature is that it does not have any sharp edges, so it's not likely to get snagged in whatever type of bag or holster you are carrying it in. Also be aware that you will not be able to carry it everywhere you go. For example, you would not be allowed to take this kind of device on an airplane, into a professional sports arena, to a concert, or any other location where such devices are not allowed. These devices are described as "less lethal," not as non-lethal. There are very real risks associated with their use, and so they should not be used lightly. In an article on the U.S. Concealed Carry Association's (USCCA) website, a law enforcement officer who was intentionally hit with a taser as part of an instructor certification class he was taking described it as being "akin to having a Tyrannosaurus Rex grab you by spinal column and shake you." The taser he was hit with was a model in TASER International's higher-end professional series, though the sensation he felt is likely identical to what someone hit with the TASER Pulse would also experience. Before getting or carrying a TASER Pulse, you would need to verify that it is legal for you to do so in your state. There are no restrictions on tasers in most states, though some require a permit and/or background check to own or concealed carry a taser. There are a few states where tasers are banned. Review the U.S. state ownership map provided on TASER International's website to get an idea of where they are banned or their use is limited. Verify specific restrictions that may apply in your area by contacting law enforcement in your state. When I tested the TASER Pulse, I quickly realized that if I ever had to use it for real, I would need to leave it behind in order to flee the attacker while he or she was still feeling the full impact of the charge (automatically 30 seconds continuously). With that in mind, TASER International will actually replace the device at no cost to the customer. Restrictions apply, including a requirement to provide a copy of the associated police report and proof of purchase of the device. See the company's "Safe Escape Product Replacement Guarantee" program for full details. While carrying a taser isn't right for everyone, those who want an option to defend themselves should they find themselves in a scary situation may find this to be a good option. It's impossible to know when an attacker might strike - criminals have been known to target people who go running or walking early in the morning or evening, as well as those who work late in the evening, or find themselves alone in deserted areas such as parking garages, and just about any other setting you can think of. This device is one option to consider when making plans to protect yourself in the event of a worst case scenario, though - of course - you are the only person who can decide if it's right for you. The author received a TASER Pulse at no cost in order to conduct an independent product review. The opinions presented here are her own.